The semantics of Polish bare NPs Ewa Rudnicka Institute of English Studies University of Wrocław. 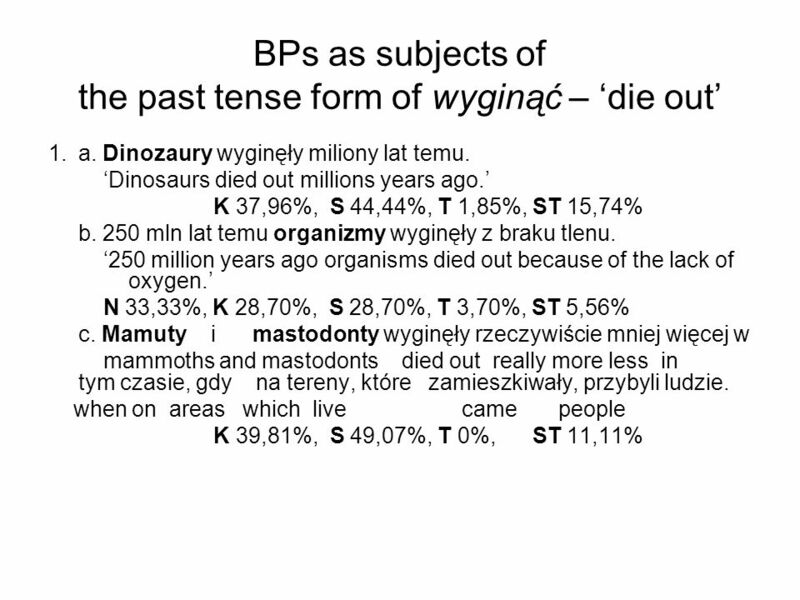 7 Observations (1) But for the highest level term organizmy – organisms, which shows a bit degraded acceptability, BPs are perfect as subjects of the past form of wyginąć – die out. 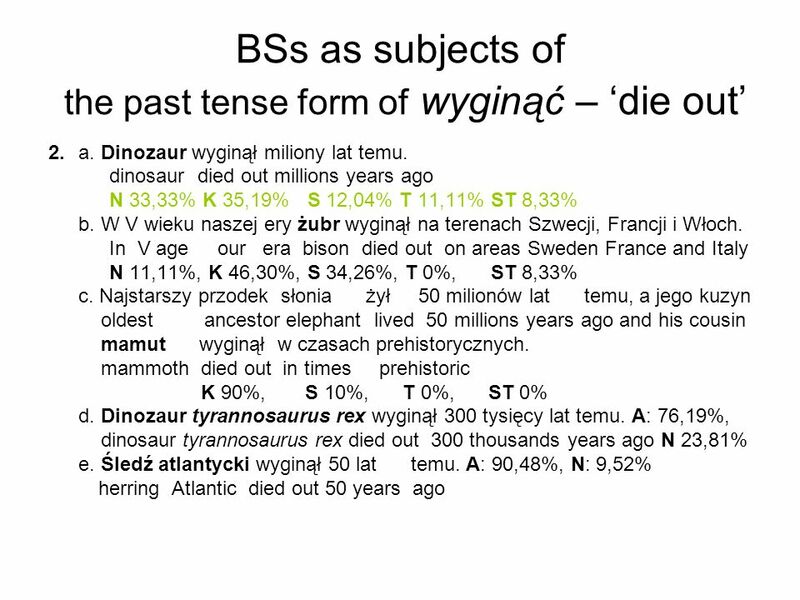 BSs pattern alike, although there appear some marginal unacceptable choices and the case of degraded acceptability occurs at a level clearly lower than in the case of BPs with dinosaur. 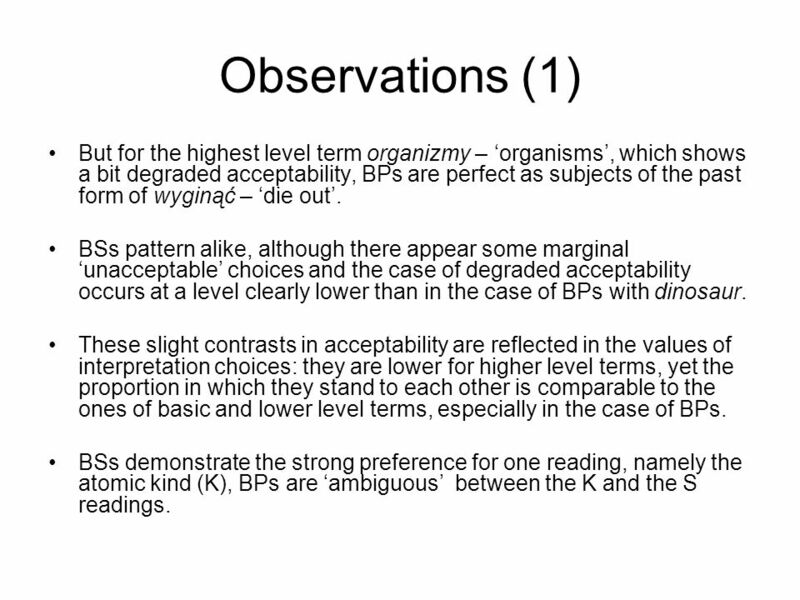 These slight contrasts in acceptability are reflected in the values of interpretation choices: they are lower for higher level terms, yet the proportion in which they stand to each other is comparable to the ones of basic and lower level terms, especially in the case of BPs. BSs demonstrate the strong preference for one reading, namely the atomic kind (K), BPs are ambiguous between the K and the S readings. 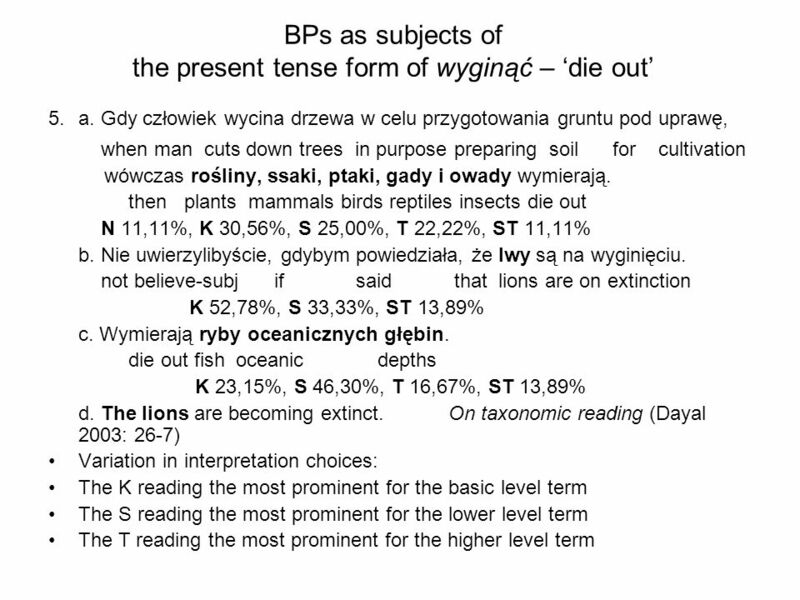 16 BPs as subjects of ewoluować – evolve 10. a. Skorupiaki ewoluowały równocześnie. 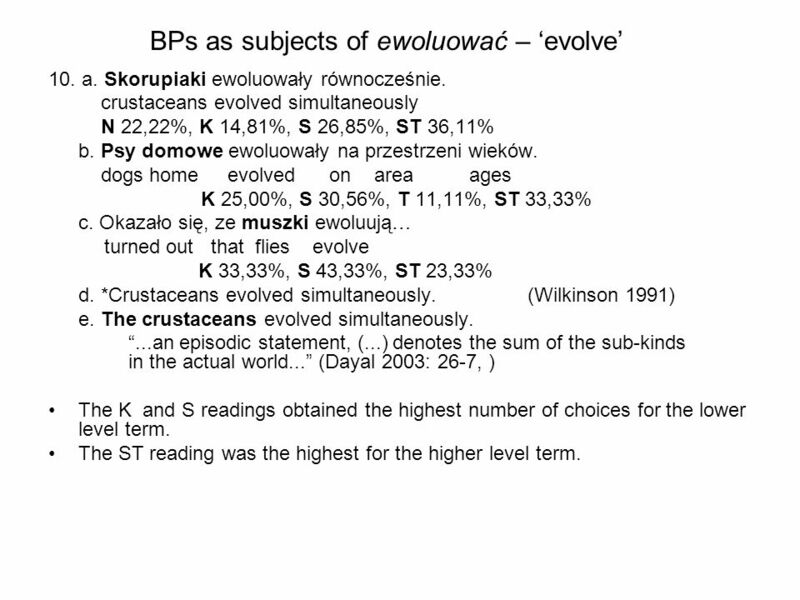 crustaceans evolved simultaneously N 22,22%, K 14,81%, S 26,85%, ST 36,11% b. Psy domowe ewoluowały na przestrzeni wieków. dogs home evolved on area ages K 25,00%, S 30,56%, T 11,11%, ST 33,33% c. Okazało się, ze muszki ewoluują… turned out that flies evolve K 33,33%, S 43,33%, ST 23,33% d. *Crustaceans evolved simultaneously. 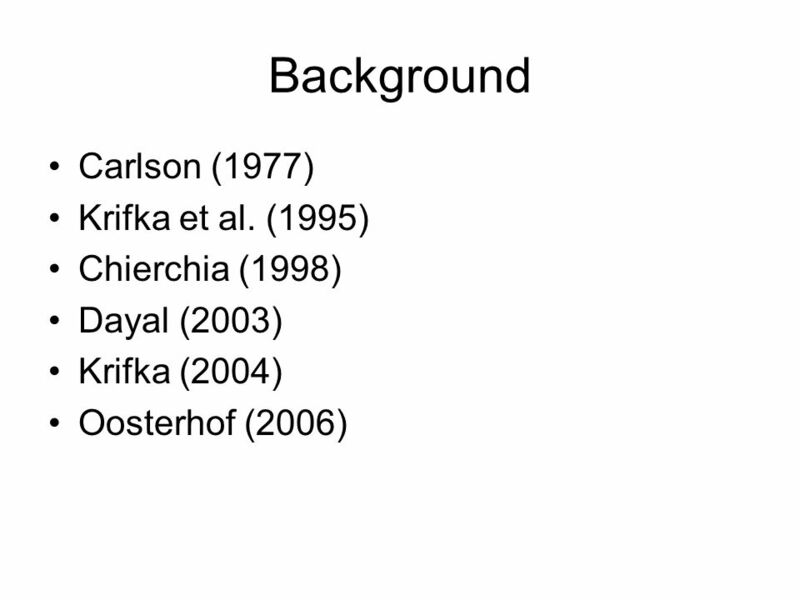 (Wilkinson 1991) e. The crustaceans evolved simultaneously....an episodic statement, (...) denotes the sum of the sub-kinds in the actual world... (Dayal 2003: 26-7, ) The K and S readings obtained the highest number of choices for the lower level term. The ST reading was the highest for the higher level term. 17 Opague verbs and quantified NPs 11. Magda chce pogadać z młodym/i psychologiem/ami Magda wants talk with young psychologist/s BS 24% for wide scope, 76% for narrow scope BP 67% for wide scope, 33% for narrow scope while BP for wide scope. 12. Każdy przeczytał książkę/i o czarownicach. every read book/s about witches BS 33% for wide scope, 67% for narrow scope BP 54% for wide scope, 46% for narrow scope Both BS and BP are ambiguous, on par with English indefinite singulars, with BS showing strong preference for narrow scope, while BP showing only slight preference for wide scope. Again, this is in contrast to English BPs which only take narrow scope. 18 Quantified adverbials 13.a. Pies był wszędzie. 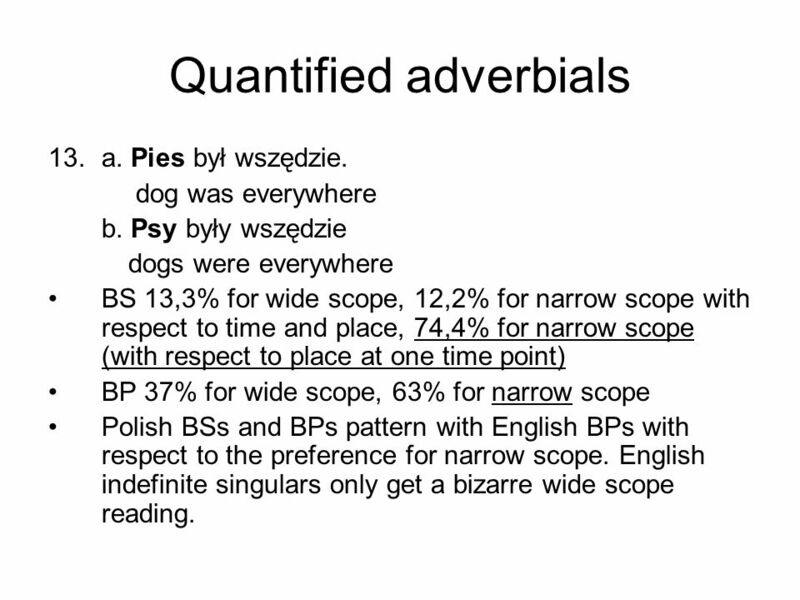 dog was everywhere b. Psy były wszędzie dogs were everywhere BS 13,3% for wide scope, 12,2% for narrow scope with respect to time and place, 74,4% for narrow scope (with respect to place at one time point) BP 37% for wide scope, 63% for narrow scope Polish BSs and BPs pattern with English BPs with respect to the preference for narrow scope. English indefinite singulars only get a bizarre wide scope reading. 19 Time adverbials 14.a. Kot był tu od czasów Kolumba. cat was here since times Columbus b. Koty były od czasów Kolumba. 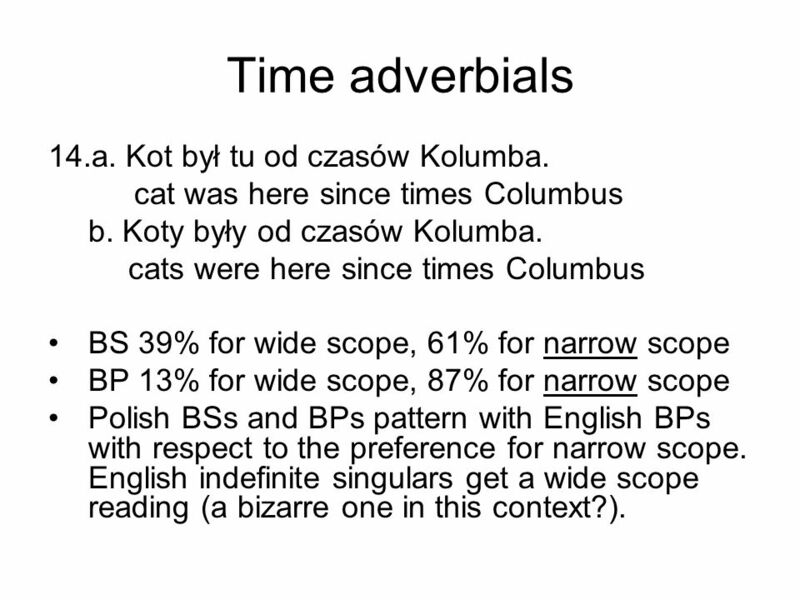 cats were here since times Columbus BS 39% for wide scope, 61% for narrow scope BP 13% for wide scope, 87% for narrow scope Polish BSs and BPs pattern with English BPs with respect to the preference for narrow scope. English indefinite singulars get a wide scope reading (a bizarre one in this context?). 20 Anaphora 15. a. Kasia szuka jednorożca i Marysia szuka go też. Katie looks for unicorn and Maggie looks for him too b. Kasia szuka jednorożca i Marysia też szuka takiego zwierzęcia. Katie looks for unicorn and Maggie too looks for such animal c. Kasia szuka jednorożców i Marysia szuka ich też. Katie looks for unicorns and Maggie looks for them too BS and pronoun 46% for wide scope, 9% for narrow scope, 45% for activity BS and such animal 13% for wide scope, 24% for narrow scope, 62% for activity BP 29% for wide scope, 16% for narrow scope, 55% for activity English indefinite singulars get only a wide scope reading in the case of personal pronoun anaphora. 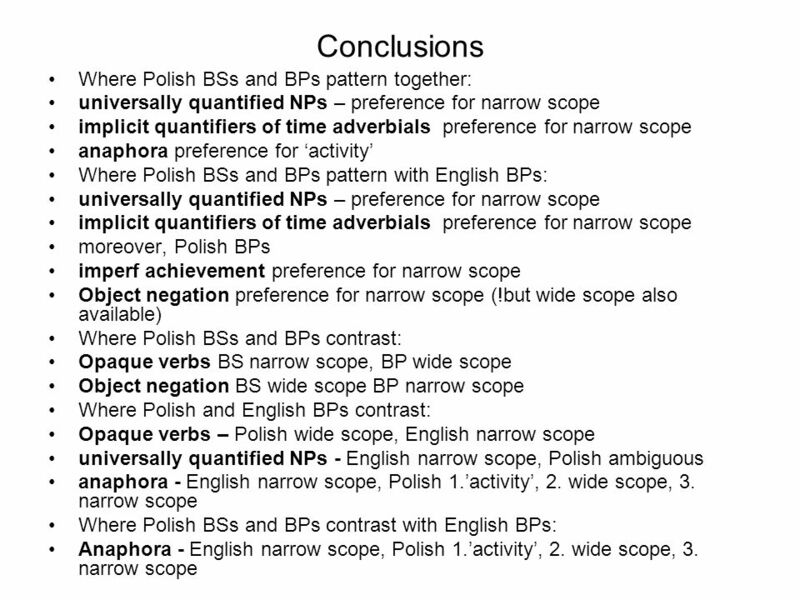 BSs show preference for activity regardless of the nature of the anaphora, which contrasts with the behaviour of English singular indefinites, which allow for it only in the case of one anaphora on par with narrow scope. In sharp contrast to English BPs which allow for narrow scope only, in the case of Polish BPs narrow scope is the least preferred reading, the strongest is the activity, while wide scope receives the value intermediate between the other two. 21 Accomplishments 16. a. *John built houses in a month. Janek z/budował domy w miesiąc. imperf BP 14% for wide scope, 86% for narrow scope perf BP 65% for wide scope, 35% for narrow scope A very strong preference for narrow scope with imperf and a strong one for wide scope with perf, which is predicted in view of minimal marking tendency b. ? ?Max discovered a rabbit in his yard for two hours. c. ? ?Max discovered several/lots of/those/most/few/sm rabbits in his yard for two hours. d. Max discovered rabbits in his yard for two hours. e. Mateusz znajdował króliczka/kilka/wiele/mnóstwo/dwadzieścia króliczków w swoim ogrodzie przez 2 godziny. BS 85% for wide scope, 15% for narrow scope Quantified NP 49% for wide scope, 51% for narrow scope English indefinite singulars are unacceptable. BS contrasts with quantified NPs in the very strong preference for wide scope. 22 Accomplishments 17. a. John discovered fleas on his dog for six weeks. b. Mateusz znajdował króliczki w swoim ogrodzie przez 2 godziny. BP 26% for wide scope, 74% for narrow scope b. Tourists discovered that quaint little village for years. c. Turyści *odkryli/odkrywali tę osobliwą małą wioskę przez lata. BP 34% for wide scope, 66% for narrow scope Polish BP patterns with English BP with respect to the preference for narrow scope. 23 Negation 18. a. Książka nie leży na półce. N 5%, W 95% book not lie on shelf b. Na półce nie leży książka. N 20%, N 35%, W 45% on shelf not lie book c. Książki nie leżą na półce. N 25%, W 75% books not lie on shelf d. Na półce nie leżą książki. N 10%, N 85 %, W 5% on shelf not lie books 19. a. Janek nie czytał książki. John not read book obj BS exist under the scope of neg 12%, exist scoping over neg 88% English indefinite singulars ambiguous b. Janek nie czytał książek. 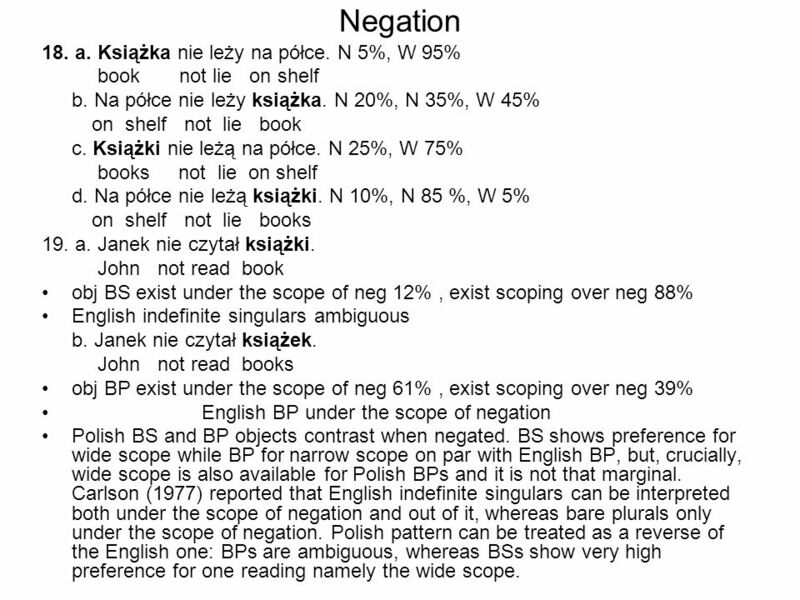 John not read books obj BP exist under the scope of neg 61%, exist scoping over neg 39% English BP under the scope of negation Polish BS and BP objects contrast when negated. BS shows preference for wide scope while BP for narrow scope on par with English BP, but, crucially, wide scope is also available for Polish BPs and it is not that marginal. 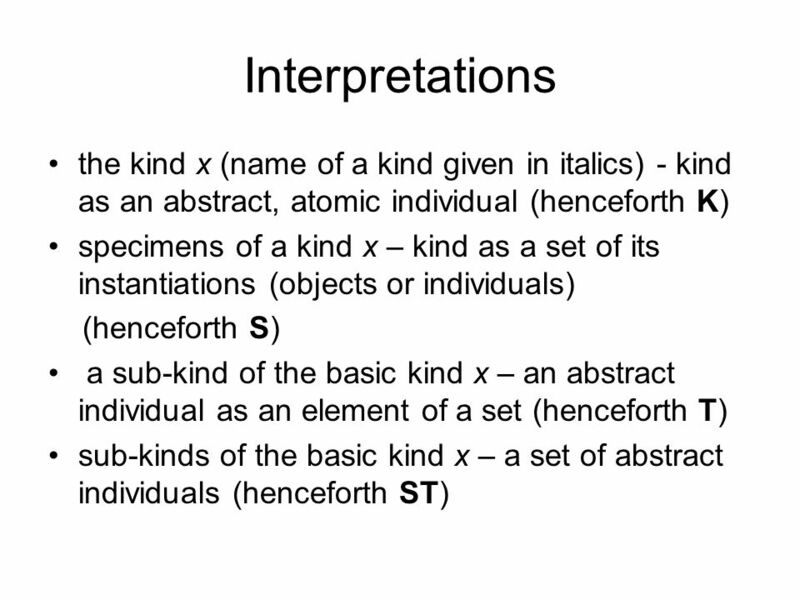 Carlson (1977) reported that English indefinite singulars can be interpreted both under the scope of negation and out of it, whereas bare plurals only under the scope of negation. 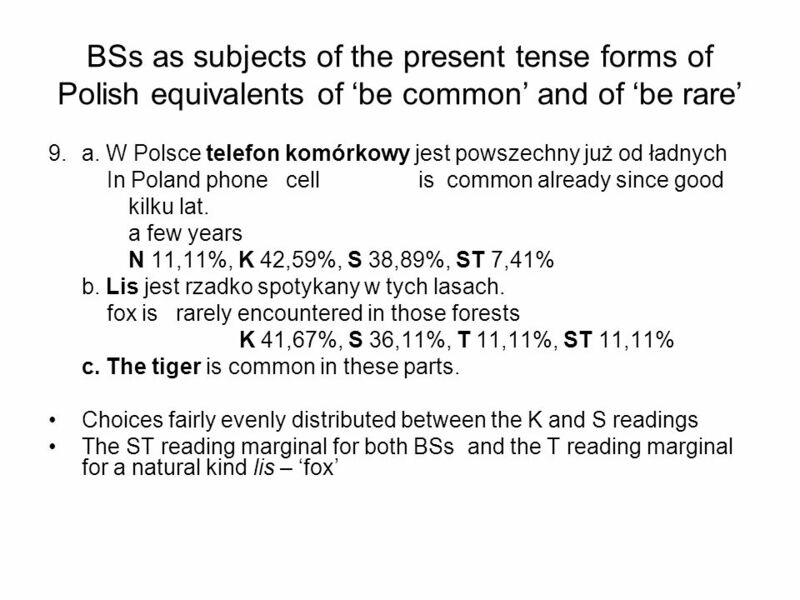 Polish pattern can be treated as a reverse of the English one: BPs are ambiguous, whereas BSs show very high preference for one reading namely the wide scope. Pobierz ppt "The semantics of Polish bare NPs Ewa Rudnicka Institute of English Studies University of Wrocław."